Detailed, up-to-date, full colour road map of the whole of Jamaica from the countries national mapping agency. 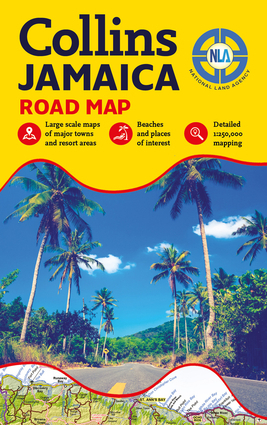 Includes tourist sites, points of interest and maps of major towns and resort areas.A detailed map at 1:250,000 of Jamaica perfect for touring the country, planning vacation or finding your way around.The detailed map includes the following:• Detailed road network with classifications• Points of interest including attractions, heritage sites, travel stops, public beaches and golf courses.• Places to stay• Key transport connections• Public service locations: police stations, post offices, fire stations• Tourist information and tour operatorsThe map is accompanied by:• Large scales maps of towns and resort areas• Distance chart• Advice for drivers• Index of all place namesHelp make your visit to Jamaica as stress free as possible with this accurate and up-to-date map of this beautiful Caribbean island. National Land Agency is Jamaica's national mapping organization.